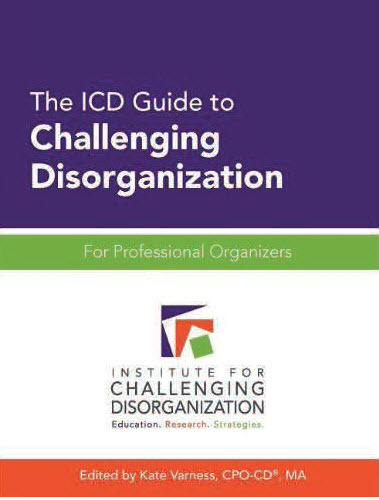 CIPA member and author Mary Anne Lessley is one of 32 contributors to the textbook ICD Guide to Challenging Disorganization for Professional Organizers. Mary Anne of Creative Organizing wrote the articles “What Is Traumatic Brain Injury?” and (Working with) “Clients with Traumatic Brain Injury.” Published by the Institute for Challenging Disorganization (ICD) and released in January 2012, the 354‐page book is required reading for the ICD exam for Level II Chronic Disorganization Specialist Certification. In addition to explaining terms associated with TBI, her chapters describe potential symptoms and make suggestions for helping clients with a variety of potential executive functioning issues that result in organizing and life skills challenges. For more information, contact Mary Anne Lessley at creative-organizing.com.